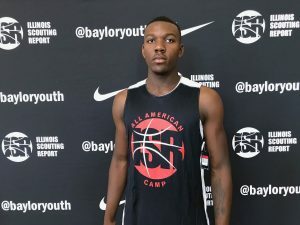 One of the biggest attractions of the weekend was Zion Griffin. 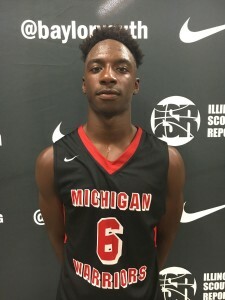 The 6’5 wing had a breakout spring and has continued to build on that momentum. Griffin was doing it all. Knocks down outside shots, although he tends to fall in love with the 3 pointers at times. Deadly in transition and can slice and dice slower defenders off the dribble. Provides great rim protection. Had many crowd buzzing dunks and blocks. 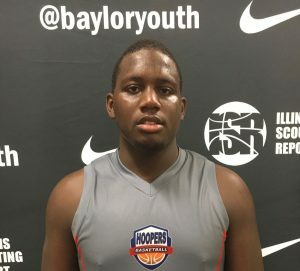 Finished with 19 points, 14 rebounds, 3 blocks vs. Illinois Fastbreak and had 19 points, 7 rebounds, 2 blocks vs. Ballers. MM prospect who will likely be picking up a few more offers this weekend. Hopefully his HS coach will let him play more than the 5 man position to showcase his abilities more when the school season begins “hint hint”. ELITE level athlete. That’s the first thing that anybody thinks when the name “Zion Young” is said. Young has a solid, muscular body with huge calves, and he is out there trying to dunk everybody. The man has no fear as he attacks the rim relentlessly. 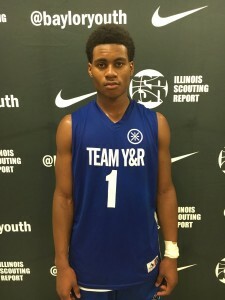 Young put on a dunk show vs Illinois Bears on day one of Chicago summer jam. Above average shooter that doesn’t always utilize his shot. Finished with 12 points. Zion should have a big year at Simeon. Sutherlin impressed with his relentless approach to the game of basketball. Everything he does is with great intensity and hustle. He recklessly attacked the rim time and time again. Dove on the floor for loose balls. Locked up his man on D with an enthusiastic approach to said defense. This kid is just plain and simple a hooper and a winner. Needs to go the JUCO route but would benefit from a year of prep ball instead. Cochran’s contributions to the team often go unnoticed. He is a sneaky stat sheet stuffer. The 6’2 guard’s game starts with defense. One of the best on-ball defenders in the state, Cochran forces countless turnovers and bad passes every game. Makes good passes, finds open players, blocks shots. Rebounds extremely well for his size. Has the same impact on the rebounding game as players 4-5 inches taller than him. Cochran picked up a Tennessee State offer tonight after showing out. Had 17 points, 6 rebounds vs. Illinois Fastbreak. Will be interesting to see where his recruiting ends up this time next summer. Maddox was going up against Sutherlin in a highly anticipated match up of teams and star players. 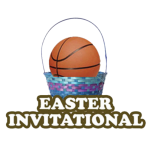 Maddox is an elite athlete with easy lift off the floor who has the size and skill to play either the 1 or the 2. His has solid handles and displayed a few dribble moves that made it hard for the defense to stay in front of him. Sound form on his jumper with a solid mid-range game as well as the ability to knock ‘em in from deep. Had a few weakside and chase down blocks as well. 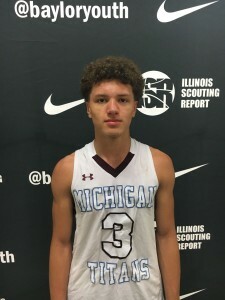 Maddox listed offers from Central Michigan and Ferris State to date but that should change after Chicago summer jam. Rich came down from Canada with a vengeance to dunk on the opposition. Strong 6’4 wing that plays very hard. Capable defender who thrives in transition offense. Just makes things happen for his team, has a winner’s mentality. 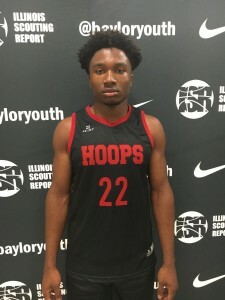 Moves well without the ball and talks on defense he showcased leadership qualities all weekend at chicago summer jam. Isa Maguire is a thin center that will benefit greatly from some time in a college weight room. Maguire has some length that he utilizes to defend the rim and rebound. Showed a few post moves. Despite his lack of strength, he goes strong the rim. Rim running center that plays well in a free-flow offense. Super smart kid who actually should be 2019 age wise. Caleb Cooper is a little guard that can really go! The jet quick 5’10 PG is a blur as he races up and down the court. Almost impossible for anyone to stay in front of him. Lethal first step as he races around defenders. Great court vision. Plays at a fast pace but makes the right reads. Sweet stroke and range on his jumper. Smaller school coaches who like small guards this is a easy roll of the dice. Williams was a new name to our radar, and he quickly captivated our attention. First and foremost what stands out his elite athleticism and jumping ability. Williams first threw down a huge baseline and-1 poster slam. He quickly followed it up with an alley-oop dunk off a baseline out of bounds play. The long, lanky 6’6 wing moves effortless across the court and fills up the stat sheet. Not a shooter but offers positional versatility. Had 11 points, 5 rebounds, 3 blocks, 3 assists vs. Hudson Elite. 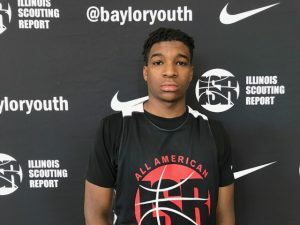 Potential breakout sleeper in the 2019 class. Taylor had himself a game in the Friday nightcap vs Hoopers with plenty of college coaches in attendance. The 6’2 lead guard has a solid body, with an especially strong lower body. Tough kid who bounces off defenders en route to the rim. Sneaky athleticism, threw down an impressive dunk in the halfcourt offense. Great court vision, makes passes most players don’t see. Streaky shooter that can really get hot. Had 22 points. Undervalued up to this point. It might help some coaches to know that he is a star football quarterback which lets you know the tuff nature of this kid, a few will miss out. 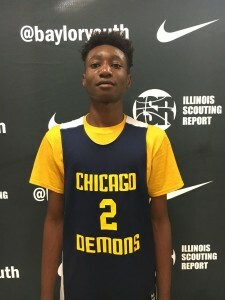 Rebounding runs in the family as Dachaun is just as efficient on the boards as his younger brother, Kendale. The high-motor combo-forward hits the boards early and often. Plus athlete that threw down an impressive poster dunk. High motor player with great intensity in every aspect of his game. Can put the ball on the floor a little and attack. Had 16 points, 7 rebounds, 2 blocks vs. Team KC. One to track in 2019 because it looks like he’s trying to transition more to showcasing some wing attributes. 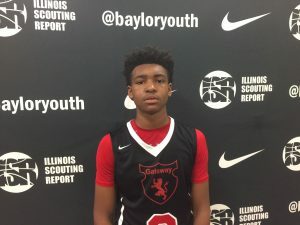 With a strong, muscular frame and an aggressive demeanor, Anderson looks like a man amongst boys playing at the 15u level. The 6’6 post does his damage on the interior. Scores off putbacks and is a rim runner. Makes his name with his rebounding ability. Out muscles players and snatches boards with his strong hands. Not easily outworked for boards. Had 9 points, 12 rebounds in an impressive showing vs TNBA South. Name to track in the 2020 class. 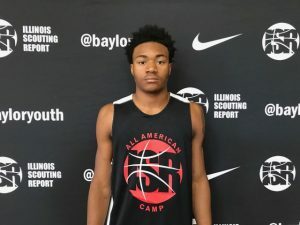 The recently reclassed Richie was one of the biggest draws for college coaches this past weekend. There were consistently 15+ coaches watching his games. Richie has a wide shouldered, strong frame that is already college ready to go. He is a jack of all trades, he does a lot of things well. Richie is a standout marksmen from deep but can also handle the ball, rebound, and defend. Look for the former D2 signee to elevate his stock to LM+ possibly solid MM after a year prepping at Don Bosco (IN). 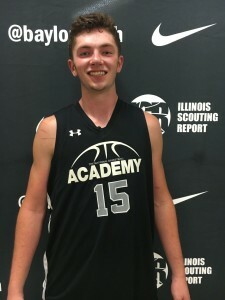 Mason McMurray was the most impressive player at the Chicago Summer Jam on championship Sunday. 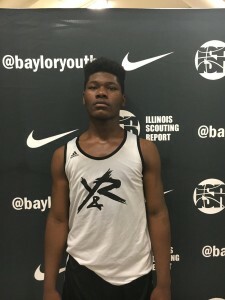 The 6’8 forward showed a diverse and solid skill set. McMurray is a solid athlete that runs and moves like a wing not a post. Spot up shooter that can also put the ball on the floor. At one point he blew by his defender for a superb two-handed jam. Hustles after every board. Great help defender that really gives a lot of effort at that end. Kevin Love-type outlet passer that also passes well out of the post and off the wing. Has a great vision for a player his size. Listed High Point, Fairmont State, and Notre Dame (OH) offers. 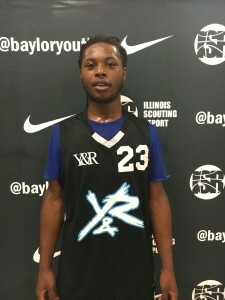 Led his team to the championship title at chicago summer jam. Burford doesn’t pass the look test, but boy is he a player. The 6’2 forward has a very wide body with a little excess weight and he almost looks like a way undersized center. And then he starts playing. Super high IQ player who makes the right read every time. Phenomenal passer with a knack for making great outlet passes. Rebounds well and has a nose for the ball. Glue guy with great intangibles and feel for the game. What he lacks in ability he makes up for with knowledge of the game. 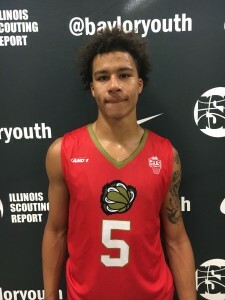 At one point a few D1’s in attendance kept saying ‘ I have kids on scholarship now that can’t do what this kid can do” If daniel was just 2 inches taller yikes. Some D2/high D3 will be very lucky to land him. Taylor is a virtually unknown guard out of Collinsville, but that is soon to change. Taylor has a very smooth game and everything he does just looks easy and natural. Hardly any defender can stay in front of him when he has the ball. Glides to the hoop and has good elevation off the floor. Crisp passer. Most of his points come off drives and transition buckets. Deadly when given space to work in the open floor. Potential D1 prospect.